Starbucks Canada will soon donate all of its unsold food - Canada Eh? 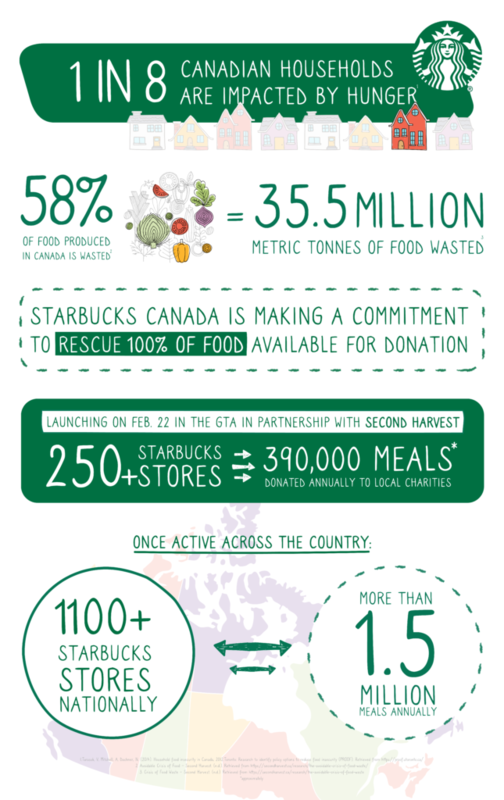 Starbucks Canada has announced that is plans to donate all unsold food products. The coffee giant’s new program, Starbucks FoodShare will partner with Second Harvest — the largest food rescue organization in Canada — to donate chilled and perishable food products to those in need. Now, the company will be donated items such as breakfast sandwiches, paninis, protein boxes, salads, yogurt, milk, and dairy alternatives like soy and coconut. “Wasted food is a wide-scale problem for everyone in the food business, while more than 4 million Canadians are impacted by hunger,” says Luisa Girotto, vice president, Public Affairs, Starbucks Canada, in a release. The program will launch in over 250 stores in the Greater Toronto Area (GTA) by February 22. The company says it is “actively working” to expand the program to more cities and provinces with the goal of having it implemented in all Canadian stores by 2021.